Moms do it all: they take care of their kids, their house, their husband, their pets, and everything in between. They do all that they do without ever asking for a thing in return, so it’s nice to see kids and families giving back to them. One of my favorites was when this mom’s kids decided to surprise her with an entire new home. Seriously, what an amazing gift they had, to be able to take care of someone who has always been taking care of you. This mom you’re about to see is 69 years old, has two jobs, and is still there for her kids with her big heart open every day. She works two jobs, and is clearly yet another impressively strong woman! 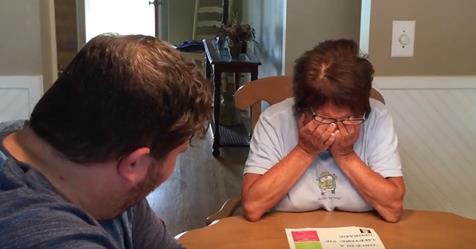 When her son gives her a gift, she gets confused in the moment. But, once he helps describe what’s going on? She loses it, and it’s the cutest, most loving reaction I’ve ever seen. You can tell from just a few seconds that she truly is a great mom, and it turns out that she has great kids, too!